Yesterday afternoon I went to see the 2010 Sundance Shorts at Coolidge Corner Theatre. The shorts ranged from funny and offbeat to dramatic and heartfelt. We had a fantastic time watching them and decided to go to Zaftigs afterward to get something to eat and talk about our favorites. 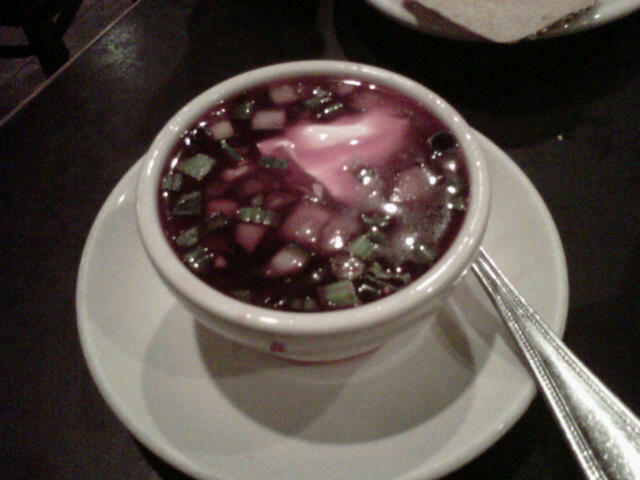 I decided to get a cup of borscht, a Ukrainian soup consisting mainly of beets, because I’d never had it before. I also got a falafel sandwich, which was great too. At Zaftigs the borscht is served either hot or cold (I ordered mine hot, but it came cold and I didn’t wanna risk spit in my soup so I just ate it) and includes beets, boiled potatoes, scallions and chopped pickles. It is served with a big ol’ dollop of sour cream on top, but since I’m not a sour cream fan, I just scooped it off. The soup was pretty good, not my favorite, and I think I’d only order it again hot so I could try it. I mean, there was nothing bad about it – the flavors were really good and I especially liked the flavor the pickles gave it. It’s not every day that you have pickles in your soup. I like beets, but maybe I don’t like them enough to have them as the main ingredient of my soup. Anyway, another successful week. I’m hoping next week to tackle Cambodian food. We’ll see! Don’t give up on Borscht, but always get it hot and next time try another version. I am partial to the Polish one. Definitely go for Polish Borscht. Not like I’m biased or anything but there’s a great restaurant in the South End. It’s called Cafe Polonia. They have red and white borscht. Good stuff.